Read nearly any police publication -- especially those written by and for the police -- and you will no doubt find pages filled with exhortations to embrace the mentality of the warrior. The idea is to encourage officers to be ready to face any challenge in the fight against crime. Visit almost any police academy, and you will hear much of the same. We train our police officers to be warriors, to be ready to face any fight and engage nearly any threat. Our officers stand on the thin blue line, ready to protect their community. In truth, that thin blue line is often a battle line we have drawn between law-abiding citizens and the criminals who would harm them. Make no mistake; law enforcement is a dangerous job. There is little question that police officers need to be ready to access their inner warrior in an instant. There are some, however, who suggest that the current model of training, and indeed culture among police departments, is setting law enforcement up for a collision course with the citizens their officers are sworn to protect. Articles, and even books such as Radley Balko's Rise of the Warrior Cop, have raised concerns for what the perceived militarization of police means for law enforcement and citizens. Throughout the modern history of policing, the relationship between law enforcement and the public they serve has often been tenuous. When the concept of a uniformed police force was first championed by Sir Robert Peel in London in the early 1800s, he was met with much resistance due to fears of what would essentially be a standing army within the city; comparisons were made to police as a government-sanctioned occupying force. The problem of how to enforce laws while preserving rights is not at all new. Public scrutiny of police officers and police departments is ever-increasing, and technology is only making that scrutiny easier. Officers have long been held to a high ethical standard, and so much more so now. Even the Rodney King tragedy in the early 1990s was a seemingly singular event due to the limited media outlets and relative cumbersome recording methods available at the time. Flash forward to the Age of the Internet and instant access to everything and anyone with a smartphone can easily and instantly expose any officer misconduct -- or the perception thereof -- to thousands, if not millions of people. And there are plenty of people who think nothing of purposefully goading officers and pushing the envelope as far as they can while remaining within their rights, all for the purpose of exposing the ignorance of police with regards to the very laws they are supposed to enforce and the rights they are sworn to uphold. 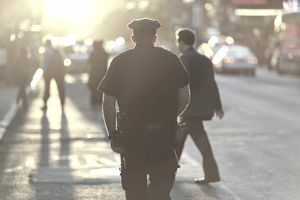 More unsettling is that research by George Washington University Professor of Sociology Ronald Weitzer, among others, indicates that the public's trust in law enforcement is significantly and negatively impacted when high-profile incidents of police misconduct are publicized. With more and more opportunities to document police acting poorly, the need is more apparent than ever to ensure officers do the right thing for the right reasons at all times, lest the public trust in the police is diminished to the point where officers can no longer perform their jobs. Unfortunately, all too often officers do not help themselves in such instances. Rather than showing measured, thoughtful and intelligent responses, officers (at least the ones who are made famous on YouTube) view any challenge to their authority as a threat that must be subdued or eliminated. This bravado is getting both citizens, and officers hurt and only serves to diminish the public trust in law enforcement further. The police force exists to maintain order and prevent crime. The approval and trust of the public are vital for police to carry out their mission. A police force's ultimate goal is to achieve voluntary compliance with the law from the public they serve. Police officers and departments must both adhere to the law and be unwavering in its enforcement; they should refrain from being swayed by public opinion but instead be concerned with promoting -- and doing -- what is always right. Uses of force and control are the last resort, not the first reaction. Other means of persuasion should be exhausted before force is used. Officers are civilians too, and members of their communities; they come from, are a part of, and are answerable to the communities they serve. The effectiveness of any police agency should not be measured by the number of arrests made or by the actions of other law enforcement, but by the absence of crime and delinquent behaviors in the community. Police departments around the world still espouse these principles in their slogans and their mission statements. It does not take long, however, for new officers to begin to see themselves as set apart from, rather than a part of, their communities. Officers and even police recruits can very quickly and easily become jaded through their regular contact with criminals and ne'er-do-wells. When this occurs, that "warrior mindset" that serves so well to protect the officer on the job can very quickly drive a wedge between the police and their citizens. That's where the concept of Guardian Policing comes in. In a sense, it's a return to those original Peelian Principles. The idea is to teach officers to view themselves not as soldiers in a war on crime but as guardians appointed to protect and uphold rights. To some, it may be a difference without distinction. In practice, though, it means smarter police officers who demonstrate a strength of mind, will, and character first, and brawn or force second -- and only then when absolutely necessary. Championed by the Blue Courage: the Heart and Mind of the Guardian organization and law enforcement leaders like former King County Sheriff Sue Rahr, Executive Director of the Washington State Criminal Justice Training Commission, the guardian concept teaches recruits to employ critical thinking, empathy, and common sense in their interactions with everyday citizens and suspected criminals alike. The training concept has been implemented in the states of Washington and Arizona so far, and while the results have yet to be seen, the hopes are high. Those hopes are that if officers view themselves as guardians and protectors of the people - all people - and their rights, they will treat each and every person they encounter with respect and dignity. In turn, when people - even criminals - feel they are treated respectfully and fairly, given a chance to express themselves and interact peacefully with the officers, then officer complaints, uses of force, and injuries to both officers and subjects will decrease.